Bitly is a powerful yet simple simple online service that lets you shorten URLs, and easily save and share your favorite links from around the internet via multiple channels including social media, email and more. Back in the day, copying and pasting URLs was the norm until Twitter decided to implement a 140 character limit on posts, also known as Tweets. Bitly solves this problem in only few minutes. The service is branded as the the world’s largest URL shortener. In essence, Bitly takes long URLs and shortens them by replacing the whole link with a series of numbers and letters. This is essential as many social media channels, particularly Twitter, have tight character count space, making sharing information fast and easy across the web. Bitly is a free service that people can get by just signing up. But aside from being free, using Bitly offers a number of advantages on top of shortening long URLs. For one, you can customize your URLs using the Bit.ly service. By leveraging Bit.ly URL shortening solution, you can customize those letters and numbers to give a more personal appearance to the URL, which can be quite valuable for marketing and branding purposes. Every Bitly link comes with its own stat page where you can access statistical information such as the the number of clicks your link has has recorded, the percentage of total clicks that came from your Bitly link, and the total clicks on all Bitly links that point to the same information or content. 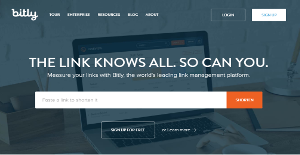 With Bitly, you can gauge the performance of your links over time. A bar graph view shows the amount of incoming traffic that is going to your link on any given day. This information can be drilled down by the hour. Ultimately, Bitly provides you information to identify trends and popular stories that attract readers in real time. With such a feature, Bitly also serves as a valuable analytic tool that helps you filter stories by topic, language, social platform, and area. Since each organization has particular business requirements, it is prudent for them to abstain from looking for a one-size-fits-all faultless software solution. Needless to say, it would be useless to try to find such an app even among widely used software platforms. The smart thing to do would be to jot down the various important factors that need consideration such as key features, budget, skill levels of staff members, company size etc. Then, you should do your groundwork thoroughly. Read some Bitly reviews and look into each of the other systems in your shortlist in detail. Such comprehensive homework can ensure you weed out ill-fitting systems and zero in on the system that presents all the elements you need for business success. How Much Does Bitly Cost? We realize that when you make a decision to buy Social Media Monitoring Software it’s important not only to see how experts evaluate it in their reviews, but also to find out if the real people and companies that buy it are actually satisfied with the product. That’s why we’ve created our behavior-based Customer Satisfaction Algorithm™ that gathers customer reviews, comments and Bitly reviews across a wide range of social media sites. The data is then presented in an easy to digest form showing how many people had positive and negative experience with Bitly. With that information at hand you should be equipped to make an informed buying decision that you won’t regret. What are Bitly pricing details? What integrations are available for Bitly? Pros: I have used bitly on two fronts: as a user needing to shorten links for personal and work user and as an analyst needing to track the clickthroughs for those links. It does all of that in a clear way and it is a perfect companion to any social/digital strategy. It is an effective tool that you can use even if you don't have any budget for digital marketing efforts. Cons: I don't have any issues with it. it would be nice though to have an Android app in the same way as I already have one on my iPhone. However, that isn't a big dealbreaker for me. Pros: Bitly makes it incredibly easy to turn those long, ugly URLs into simple, shareable links that we use for social content. One of the better features is its ability to look historically at what links performed best, since you can view your Bitly history anytime, and re-use them, which makes building an ongoing social content calendar much easier. Though I'm not a fan of them myself, you can also create QR codes with your Bitly links, and clicks are aggregated with your URL data. You can even create your own shortened links too. Cons: The one major dislike I have is that at any time, a competitor can just add a "+" to the end of any of my Bitly links and see its performance data. I wish there was a way to make that information private. If you need more information about Bitly or you simply have a question let us know what you need and we’ll forward your request directly to the vendor.